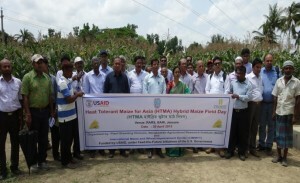 The field day on “Heat Tolerant Maize for Asia (HTMA) Hybrid Maize” was jointly organized by Plant Breeding Division, Bangladesh Agricultural Research Institute (BARI), and CIMMYT on 20th April, 2015 at the Regional Agricultural Research Station (RARS), Khoirtola, Jessore. 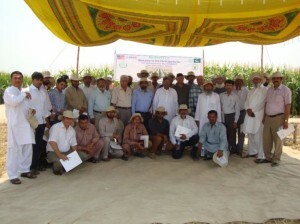 The field day was attended by the representatives from private seed companies viz., Lal Teer Seed Ltd., Supreme Seed Company Ltd., ACI Ltd., Krishibid Group, Monsanto India Ltd., Syngenta (Bangladesh) Ltd., Petrochem (Bangladesh) Ltd.; NGOs viz., Bangladesh Rural Advancement Committee(BRAC) and Christian Commission for Development in Bangladesh (CCDB); development institution like Katalyst; public sector seed production agency i.e., Bangladesh Agricultural Development Corporation(BADC); and the scientists from CIMMYT and BARI. Apart from this, representatives from Department of Agricultural Extension (DAE), Agrovet people, and maize farmers were also participated in this event. The participants scored the hybrids and selected the best bet hybrids in relation to the performance of the commercial check. 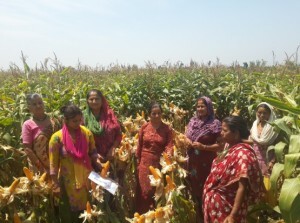 A final selection by the breeders lead to the licensing of 6 hybrids to BARI of which two had been sub-licensed by BARI to private seed company (ACI) by BARI for a wider reach and adaptation in Bangladesh. The HTMA hybrid field day was organized by MMRI on 4th June, 2015. 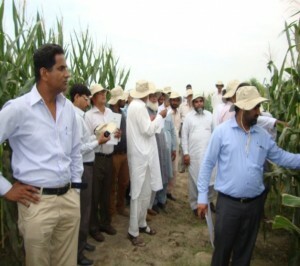 Participants first visited the hybrid demo planted at MMRI, Sahiwal and then at Zamidara Seeds farm at Depalpur. 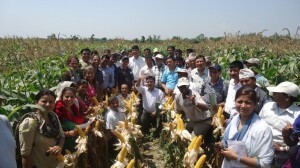 Participants from different seed companies showed lot of interest and appreciate this initiative that gave them opportunity to see CIMMYT-HTMA good performing material to national seed sector. 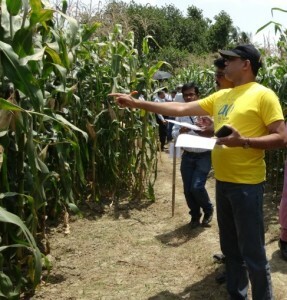 Participants walked through the demo, plot-by-plot, selected good performing material of their own interest, and submitted their selection list to Director, MMRI for forwarding to CIMMYT.